Whistle: Rubiel Vazquez; Craig Lowry, Adam Wienckowski; Christopher Penso; Kevin Terry Jr. The 2018 MLS Season kicks off this Saturday when New England Revolution face Philadelphia Union at Talen Energy Stadium. We made it! As enjoyable and entertaining as preseason friendlies can be, this is the first real action for the team since October. And while the Union lineup is mostly familiar faces (and well-marketed additions), the opposition side features many additions, and one significant absence, compared to the Revolution team last year. So not only is this the first time we’ll be seeing the 2018 Union play a game that matters, it will also be the first chance to gauge their progress against the ever-changing MLS competition. The Revs have had a quietly good offseason. New this year are Penilla and Zahibo, coming from clubs in Mexico and Spain respectively. They’re not the kind of players that make headlines outside of Revs circles, but they do strengthen the Revolutions roster significantly. 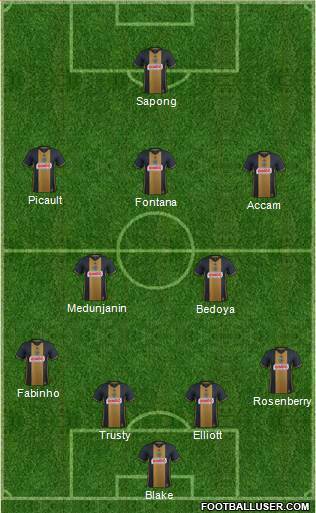 Pair that with the returning talents of Rowe and Agudelo and New England could have an exciting attack this season. At the back, Cropper is no slouch in goal, and DP Claude Dielna may be aging but it will be no easy task to get past him. Somi, the third new signing expected in the starting XI, is a product of Sweden’s league system, and at 26 could turn out to be a valuable acquisition for the Revs. But all of this exists in the shadow of the dominant headline for New England this offseason: Lee Nguyen. Unhappy with a yet unidentified aspect of his tenure at New England, he arrived late to preseason camp and has been openly campaigning for a trade for several weeks now. He is not expected to be in the lineup on Saturday, nominaly due to fitness issues though there can be no doubt it’s partially a result of his dissatisfaction with the club, or their dissatisfaction with him. As exciting as Kellyn Rowe is as a prospect, it will be asking a lot to expect him to fill Nguyen’s shoes, and the Revolution may have a hard time finding space without him. We’ll start things off by answering the question many will be asking. No, we shouldn’t expect Bořek Dočkal to make a meaningful appearance in this game. Even though he wants to be a part of the game, he’s coming back from a (minor) ankle injury and still not integrated into the team. And with the Union getting two bye weeks in the next month, there’s simply no rush. With that said he should be near match-fit, as the Chinese Super League runs on a similar schedule to MLS, so he could sneak into the 18. Or maybe even get a late game substitution depending on the scoreline. But no matter what we shouldn’t expect to really learn anything about who Dočkal is as a player this weekend. With that out of the way, there’s still plenty to consider leading up to this match. Anthony Fontana seems the most likely candidate to play as the No. 10, which brings us to what could be the most pressing question for the team this season: will the kids be good? And Fabian Herbers will be making his return after missing most of 2017 with an injury. The back line especially will rely heavily on young talent this season, from true rookies like Matt Real and Auston Trusty to sophomores like Jack Elliott and Keegan Rosenberry. So while Fontana’s time at 10 may be limited once Dočkal is match fit, this team will still need young players to step up if this team is going to be competitive this season. Up front a respectable if not dangerous attacking corps leaves questions of their own. Will C.J. Sapong be able to deliver another marquee performance? Will he need to with the addition of Accam and Dočkal? How will Picault and Herbers fit in to the remaining lineup space? There’s a lot of uncertainty with this lineup, but if it all works out the way it should, the Union will be a very exciting team to watch this weekend and through the rest of the season. Injury report: None officially, though there’s still no word on Ilsinho’s hamstring. Agudelo may not be the hottest striker in the league, but he’s more than capable of challenging most MLS Defenses. 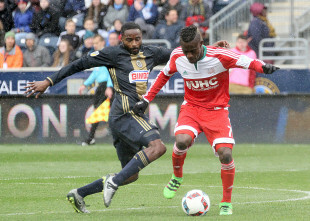 But the Union won’t be fielding a standard MLS defense. Fabinho’s the veteran but not exactly a player that inspires clean sheets, leaving the burden on the young shoulders of Trusty, Elliott, and Rosneberry. Trusty is at this point an unknown quantity, so who knows what we can expect from him. Elliott and Rosenberry on the other hand are clearly capable of doing excellent work. But they’re also capable of green mistakes. If these three young players step up it will bode well for this match and the rest of the season, but if they don’t the Union could find themselves still short of a full starting XI. He’s faded into the background with all the hubbub around Bořek Dočkal, but the implications of his move from Chicago shouldn’t be undervalued. He’ll have at least this game and the next against Columbus to shine on his own before the Czech can be reasonably expected to see the field. He’s obviously a goal scoring threat, finding the back of the net 14 times as part of Chicago’s high-octane offense. But even if he doesn’t score he’ll take pressure off C.J. Sapong, which has plenty of value in and of itself. The line between the Union and New England was very thin last year. They finished next to each other in the standings and each team beat the other at home 3-0 in their only two meetings last year. And coming into this weekend both teams have addressed positions of need in their rosters with players that may not be blockbusters, but should elevate the team’s level of play. But the Union have a slight advantage with Nguyen likely missing the game, and paired with what should be a home-field advantage the Union should start 2018 off right with a win over New England. Even if it’s close. As part of MLS’ broadcast deal, all MLS games will be available to watch on the yet-t0-be-launched ESPN+ streaming platform. Until that service launches however, all non-nationally televised MLS games will be available FOR FREE on MLSsoccer.com or through MLS apps on your smartphone, Apple TV, or Roku. In addition, keep an eye on PSP Twitter for game coverage including pre- and post-game coverage. Finally a game between Philadelphia and New England that I care about! First time since last July. This has to be the hardest preview of the season to write. We have no idea how good any team is (with a few exceptions) until a few weeks in. But it’s damn good to have these back! My prediction is bone-chilling cold. The kind that comes from being in a large open-air concrete structure on the river…oofah! Predicted to be around 40° in Chester at kickoff. Not bone-chilling, but definitely not warm. That’s the listed temp, it will feel much colder than that. Work on the river ,Jersey side,every day! The wind will be the killer!! I always kinda have it in my mind that The Revs totally stink. Looking at this lineup and some of the moves, that’s not totally the case. Let’s just hope everyone gels and we get started with a win. CJ is a mudder, I think he plays well. The Revs lineup, especially on offense, always looks pretty good, and then they actually stink when the games are played.